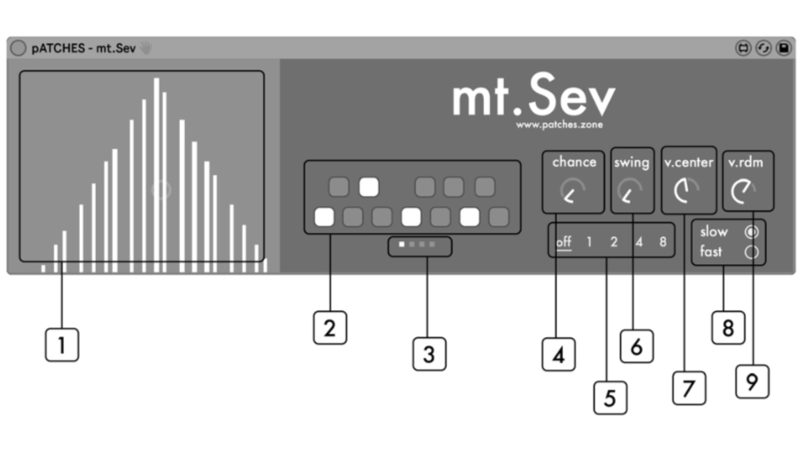 mt.Sev (Mount Sev, Sev Mountain) is a semi- random arpeggiator-like MIDI mechanism for creating generative music. It’s controllable to a degree but also surprising and unpredictable, forming melodies and chords you may not have otherwise thought to play. mt.Sev’s controls aren’t so much strict settings as general guidelines and constraints. These parameters shape the output according to some logic but allow it to remain loose and interest- ing. The “live” factor is more or less built into these controls when you set them so there’s less of a need to constantly adjust them - focus more on what you layer with mt.Sev’s MIDI. 1. the mountain - An interactive XY pad for controlling the note range with intuitive visual feedback. X determines the central octave. Y determines the octave range. 2. note selector - Active notes that are made available to mt.Sev. This determines the pitches/ chord/key of the MIDI output. 3. bank selector - Selects between four note selector banks. Only one bank may be active at a time. 4. chance - Determines the likelihood of a note firing off - from impossible to constant chords. 5. sequence rate - The rate at which the sequencer moves between banks (in bars). “Off” turns off the sequencer. 6. swing - Sets the swing or “triplet-feel” of the rhythm. 8. v.rdm - Determines how random the note velocity will be, centered around the “v.center” value. 9. speed selector - Selects between 1/8th notes and 1/16th notes. The first 8 controls are automapped for instant availability on your control surface or Push. The easiest way to toggle notes into mt.Sev is by clicking them on the piano layout with your mouse. If you want to make more than one note grouping, select a different bank by clicking the dots below the piano layout. These banks could be used to create different chords in a progression or a key change in the middle of a song. You can switch between these as needed with your notes saved in each bank. To step away from the computer a bit more, you can also enter notes into mt.Sev from your controller. To enter note input mode, simply hold the pitch wheel on your Push or keyboard all the way down. Any keys you press while the pitch wheel is held down will toggle the corresponding note on or off in the Sev, regardless of octave. Release the pitch wheel to exit note input mode and the notes you play on your keys will pass directly on to the instrument that follows mt.Sev in the chain. One of the most fun ways to use this device is to allow it to randomly generate a few notes in a certain key, then play additional notes manually in that key. The MIDI you play will bypass the Sev and go directly to the instrument on the other side of the chain. in the note selector. The X position of the mountain determines the octave that notes in the note selector will be centered around. The height of the mountain determines the breadth of the selection - more height = more likely the surrounding octaves will trigger notes. but can be changed manually. “1” will change banks from left to right every 1 bar, “2” will change banks every 2 bars, “4” changes banks every 4 bars, and so on. While the sequencer is active, banks can not be manually selected. You can, however, input notes while the progression is active using either of the note input methods. Whichever bank is currently selected can be edited in this way. Notes have been made active in the note selector. mt.Sev can’t output notes if it doesn’t have any to select from! The chance may be set to “0”. No MIDI will be generated by mt.Sev unless there is some probability for notes to be triggered. Make sure you have a MIDI instrument following mt.Sev in the chain. mt. Sev doesn’t generate sound, only notes for other instruments to play. Try varying the placement of the mountain. It’s possible the octave range falls outside what the instrument can play. Certain instruments - such as Boscomac’s modeled Koto or Ableton’s sampled orchestral pack, for example - are unable to play notes that are too low or too high. You may find it helpful to start with the Y position all the way down to scan which octave sounds the best for your instrument. Then, slowly raise the height of the mountain until you like the range notes are pulled from.